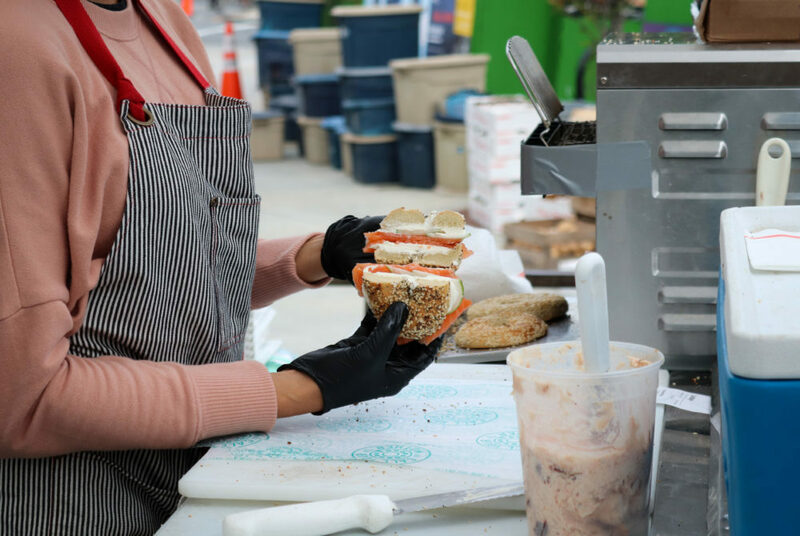 An employee prepares bagel sandwiches at Call Your Mother's stand at the Dupont Circle Farmers Market. 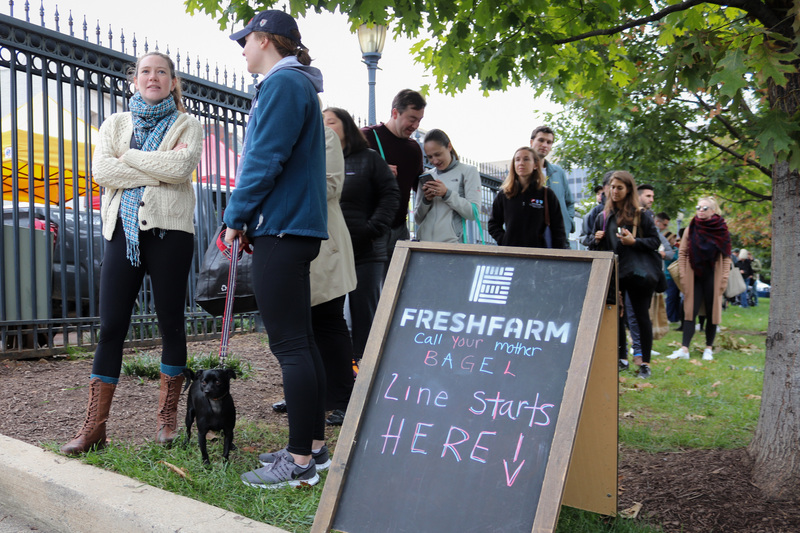 Every Sunday in the early morning hours before the Dupont Circle Farmers Market officially opens and as vendors set up their tables, a line of dedicated customers slowly grows in front of a hipster-style bagel stand. On other days, a similar scene has unfolded at other farmers markets around D.C. for the past several months. Call Your Mother opened the doors to its first storefront at 3301 Georgia Ave. NW Thursday, but the Jewish-inspired deli had already gained a cult following thanks to appearances at farmers markets across the District. The shop is open from 8 a.m. to 2 p.m. Tuesday through Sunday, but a line has begun snaking down the street before it opens each morning since opening day. Prior to opening its first brick-and-mortar location, Call Your Mother posted up at local farmers markets and sold limited options of loaded sandwiches. Dana said he guessed the bagels would find success based on Timber Pizza Co.’s following, but he didn’t predict selling out of bagels each weekend in just an hour. Call Your Mother opened its first storefront at 3301 Georgia Ave. NW Thursday. The restaurant serves Jewish classics like bagels ($2.50), latkes ($4.50) and spreads like white fish salad and smoked ($5) or candied ($6) salmon. Alongside classic stacked bagel sandwiches are curveballs like the #4 sandwich ($9), a bagel with peach jam, cream cheese, bacon, jalapeno and chips on a plain bagel, and pastrami empanadas ($8). The menu is inspired by owner Andrew Dana’s childhood growing up eating bagels every weekend morning with his father, who always dreamed of owning a deli. Dana and co-owner Chris Brady left jobs in the tech industry to pursue their culinary instincts – first serving pizza at farmers markets in 2014 before opening Timber Pizza Co. at 809 Upshur St. NW in 2016. The food takes inspiration from local farmers markets they frequent, where Dana said they look for the best seasonal produce, seasonal fruits and micrograins. Call Your Mother also serves coffee ($2.75) and espresso drinks like lattes ($4) and mochas ($4.50) with beans provided by D.C.-based company Lost Sock Roasters. Robert Valdes, a frequent customer at Call Your Mother, said he first found out about the bagels while scrolling through Instagram. Customers wait in line for bagels at the Dupont Circle Farmers Market. Valdes has now gone to the Dupont Circle market at 8:15 a.m. every Sunday for the past month and a half to get his morning bagel. Kara Rawlings and Melissa Eckels, who both traveled to the farmers market from southern Maryland Sunday morning, said it is difficult to find high-quality bagels in the District. Eckles said she was anxious to see if the bagels measured up to those found in New York or New Jersey. 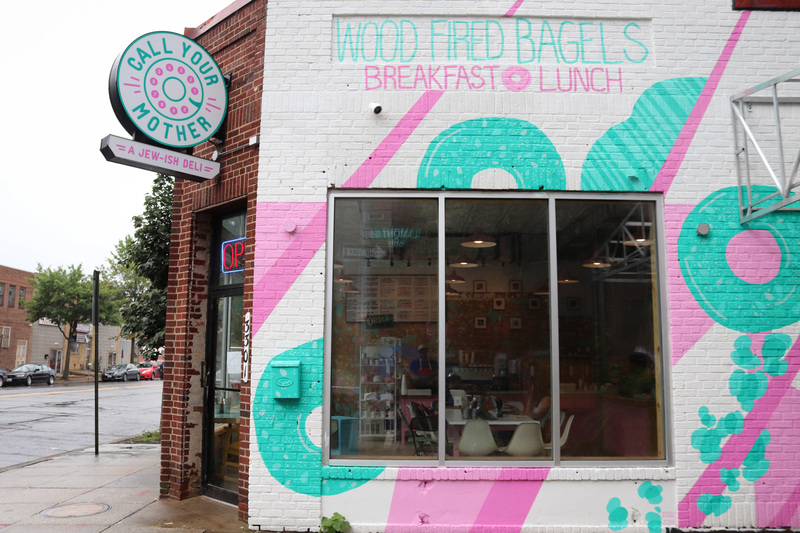 Back at its brick-and-mortar restaurant, the decor pops with modern bursts of pink and turquoise both on the exterior with giant turquoise bagels covering the brick and inside the shop with pink, turquoise and gold wallpaper. Atop the colorful wallpaper, framed photos of the rapper Drake, who is half-Jewish, like the owner. Customers may say D.C. is not particularly known as a bagel city, but Dana said he hopes to spice up the market with the new storefront, now stocked with plenty of inventory to satisfy lines of new customers and devoted fans. “Adding to the mix and hoping to elevate the whole bagel profile of the city, and then doing our own little twist on it too,” Dana said.